Call me crazy but I have 3 levels of Right Start Math that I am currently teaching. Yes, you read that correctly. This year I was teaching Levels A, B, and D. Now I have two kids who recently moved up so for the spring semester we are working on Levels B, C, and D.
Does math take me all day? Nope. Here’s how I teach multiple levels of a teacher-intensive math program without losing my mind (and using up every second of our school day). I have a set time for math. For my youngest child who is now in Level B I only do math for 20 minutes. For my middle child who is now in Level C, I give him about 25 minutes for math time. My oldest has a max time of 30 minutes (but math usually only takes us 20 minutes). When our math time is over, I move on to the next subject. This means that we don’t always finish an entire math lesson in one day. That’s ok – I have a sticky note for that! I just put our sticky note right next to the section where we need to begin our math time the next day. I assign most worksheets as independent work once my children are in Level C.
In Levels A and B I always sit next to my children while they do their worksheets so I can read instructions to them or help them with problems. Once my children are about halfway into Level C, those worksheets are completed without me next to them. This allows me to move on to working with another child while that child completes the pages. It saves quite a bit of time. I also assign all fact pages as independent work. The program directs me to time my children as they complete these fact pages. This makes my kids anxious and frustrated. Instead of sitting there as they work through these pages, I let them do them while I work with someone else. Then I come back and check their pages when they are finished. I don’t waste my time sitting there staring at them while they work and they aren’t annoyed that I’m doing just that – staring at them impatiently as they work. I don’t always do games during the lesson. Sometimes we take a day where we do nothing but play games. And if a game is assigned at the end of a lesson, I simply do it the next day as our entire lesson time. The games often drag out the lessons so I make them a separate day’s work and use them as a reward. 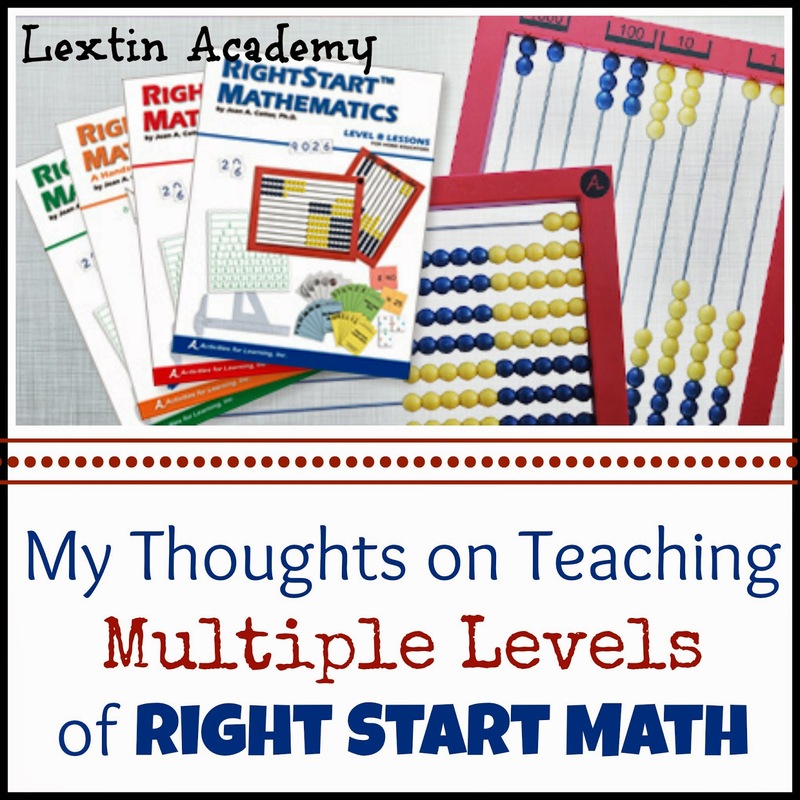 It might sound overwhelming to teach multiple levels of Right Start in the same school year. But I’ve found that it doesn’t take too much time out of our day. The later levels have fewer manipulatives so I find that the lessons seem shorter. In the higher levels, I require my kids to work more independently. The lessons introduce topics incrementally so that kids are learning in bite-sized pieces. This means that information is not overwhelming them which equals shorter lesson times. I keep small white boards on our table and use these to illustrate all the concepts in the lessons. I cut some lessons in half and do them over multiple days so that math time does not seem endless. My kids have gained such a solid foundation in math thanks to Right Start, and I think that’s another reason why the later lessons don’t take as long. I teach the lesson and my kids’ eyes light up as they grasp the concept. It’s incremental and the lessons build on themselves so that each day we are learning new pieces of the mathematical puzzle. This is such a helpful post, and I've linked to it a few times in the Rightstart Math swap facebook group. Thank you!